Performers include: Andrew Lincoln, Jon Bernthal, Sarah Wayne Callies, Laurie Holden, Jeffrey DeMunn, Steven Yeun, Chandler Riggs, Norman Reedus, Melissa McBride, IronE Singleton, Madison Lintz, Michael Rooker, Emma Bell, Jeryl Prescott Sales, Andrew Rothenberg, Juan Pareja, Adam Minarovich, and Noah Emmerich. After being wounded in the line of duty, County Sheriff Rick Grimes (Andrew Lincoln) spends weeks in a coma. He wakes up in an empty hospital and learns that the world has been ravaged by a zombie epidemic and is overrun with the walking dead. While trying to survive he searches for his wife Lori (Sarah Wayne Callies) and their young son, Carl (Chandler Riggs). A smart and calm leader, Rick sets off for Atlanta where the Center for Disease Control and Prevention is said to have set up a quarantined safe-zone. Rick has been friends with his partner Shane Walsh (Jon Bernthal) since high school. After the apocalypse, Shane helped take care of Rick’s family by fleeing with them toward Atlanta. Believing Rick to be dead, he and Lori start a romantic relationship. They end up helping to establish a camp with a small group of survivors outside the city. 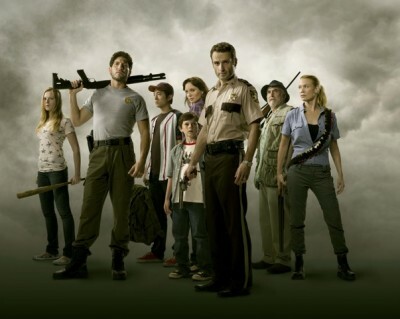 Other characters include Andrea (Laurie Holden), a successful civil rights attorney who has a younger sister, Amy (Emma Bell); Dale Horvath (Jeffrey DeMunn), an older man who owns the RV that the survivors use in their community; and Glenn (Steven Yeun), a former pizza delivery boy who takes part in dangerous missions. They just removed Chris Hardwick as host of Talking Dead. They say it is just “Temporary.” That means he is finished. I will never watch it again. The Lady(Her Last name is Brown) who is doing Comic Con, is going to host it. When the ratings go in the Toilet, they will scream RACISM! Has turned into a boring, kill air time show. Was wonderful and now awful. Love it always !!! It has all the qualities of a great show! Love the dead ! Please keep for a long time! This is my favorite show! However, if they kill Michonne or the whole Richonne situation… I will no longer watch! LOL… but serious at the same time though! This is one of those shows that you get mad that it goes off at the end of the episode. You want the episode to just go on and on. LOL! Love this show. They would be nuts if they canceled it! MAC would be crazy cancelling this show!! Cancelling this show would be like HBO cancelling Game of Thrones!! Nuts!!! The Walking Dead is the best show ever! I hate the idea that it will end one day. Not interested in the new Fear the Walking Dead. PLEASE renew/renew/renew as long as you can!